MARC'S LUNCH BOX: A BLOG SERIES! Eating healthy is important. It's what keeps you lean and, generally speaking, alive. But it can be super duper hard. I myself struggle with the healthy eats, in large because the crappy food tastes soooo much better, especially if you have gotten used to eating it. That being said, healthy eating can consist of more than just raw veggies and bland chicken, right? 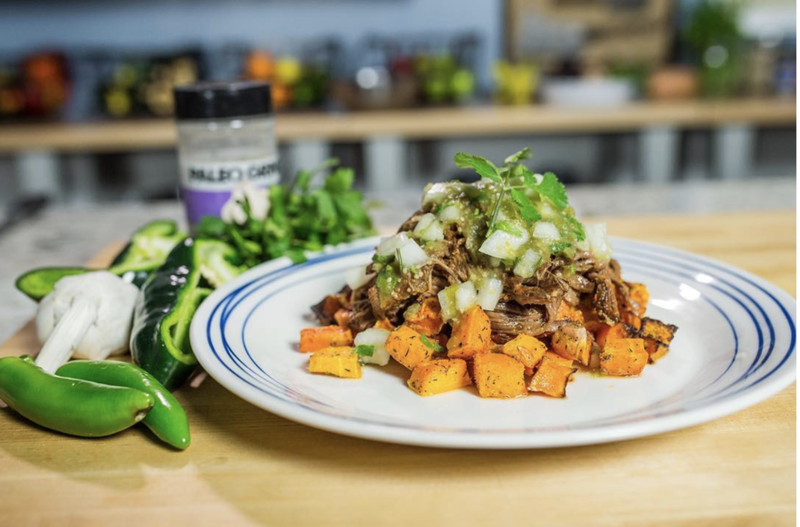 I searched high and low for a place to find easy to make foods that will keep the taste buds singing, and I stumbled across good ole Nick Massie aka Paleo Nick. Shout out to this cool dude who started small with paleo recipes from his home kitchen, and now he's running Ice Age meals like a champ. He has tons of recipes out there that are nutritious, delicious, and easy to make. My typical weekend meal prep will consist of some of his bigger recipes. I'll pick one out and give it a try, and then portion out the food into my lunches for the week. I figured I would write about them when I try them, give you my humble review, and post it here so you can try it on your own if you want! I know, very exciting, I eat more than just Croatian pizza! Stay tuned my friends for my upcoming review on this week's meal! Want to chat with me more? Shoot me an email to: marc@voyedgerx.com or comment down below. Looking for some information on developing a good calisthenics and fitness routine? Read here in this guest blog and find out what to eat, how to workout and how to plan it all. Sheila Olen of FitSheila.com is back with a few more tips on how to be healthier in 2019. What’s the deal with keto wine? And what can you pair it with? Looking to improve the quality of your sleep? We’ve got a few tips for you from our guest blogger, Sheila Olsen. Marc tries out Beef Barbacoa this week! Get the recipe and see how he made this latest dish from Ice Age meals. Here’s what CrossFit has to say about nutrition and a healthy diet. Marc tries out Tomatillo Pork Green Chile this week! See how he made it and where he got the recipe from. Marc’s got a new food series! Tune in weekly for his adventures in the culinary world. Are there carbs in wine? Reagan from ILoveWine.com dives into the facts. Find out what CrossFit’s new policy on transgender athletes will be in the upcoming Games season. Find out the latest news on this household weight loss brand. And what do you think of their new logo? Need some tips on how travel can change you for the better? Read this guest blog on the mental health effects of taking a much needed adventure vacation. Looking to avoid neck and shoulder pain at work? Here are some tips to help you make the most out of your desk space. Here’s what happened on Day 1 of the 2018 CrossFit Games with information and data from: The Morning Chalk-Up, CrossFit.com, and The Barbell Spin. Read more in the blog. Need some tips on how to relax while on vacation? Here’s a sponsored post by: The Recovery Village on how to reduce stress and make the most of your time off. Want to know how to meal prep and count your macros before a big camping trip? Here are some tips from Level 1 CF trainer, Caroline Ofenstein. Need some tips for sleeping better? Caroline Ofenstein from m2nutrition has some insight on how to sleep better and what to do before bed. Need some reasons to cut the sugar from your diet? Read our latest blog on why you need to avoid added sugars PERIOD. To be at your best, you are going to need some carbohydrates. See why if you are doing a high-intensity sport like CrossFit, you are going to need well-timed nutrients like some grains. Always go unprocessed and read more in the blog from Caroline or M2 Performance Nutrition. Guest blog by: Caroline Collins CrossFit Level 1 Trainer of Macros & Muscles in Salida, Colorado. Read more about her 5 tips for healthy lifestyle living in the blog below. Guest blog post by: Henry Moore of FitWellTraveler.com details how to stay fit and active while traveling! Marc is back with his weekly wisdom, this time with some thoughts on prepping for the 2018 CrossFit Open. Question #1 - Should you, "Open prep?"